In memory of Louis (Lajos) Jokay, born in 1924 (Hungary) and died in 1993, in Chicago. 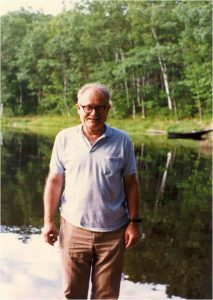 The photo was taken in the late 1980s at Finger Lake, near Rhinelander, Wisconsin, at the annual summer camp of Chicago’s Hungarian Scout Troop 19. The Jokay Family Foundation was established in Hungary in 2003, as an informal successor to the Lajos Jokay Foundation (Indianapolis) that existed between 1993 and 2003. Lajos Jokay left his native Hungary in 1945, and after a few years as a displaced person in Germany, emigrated to the US in 1949. He attended Berea College in Kentucky, and Michigan State University, earning an MS in Dairy Science. He worked at the US Army’s Food and Container Institute in Chicago in the late 1950s and through the 1960s, where he was instrumental in developing the space foods used by the Gemini and Mercury progams. Lajos Jokay later worked as a research scientist at GD Searle, and took part in the discovery of practical applications for aspartame. Lajos Jokay retired in the early 1980s after several other research positions in the food, flavors and spice industry. Mr. Jokay was active in the Hungarian-American community in Chicago, including scouting, and several charitable and social organizations. After his death in 1993, his children established a foundation in his memory to provide scholarships at his alma mater, the Reformed Church’s High School at Papa, Hungary. Established in 1531, this school educated many generations of Lajos Jokay’s ancestors, and it was his wish to provide scholarships to bright and deserving, yet poor students from small villages who were thus given a real chance for social advancement. As two of his three American-born children moved to Hungary in the mid to late 1990s, the family decided to establish a Hungarian foundation that in addition to serving his memory through scholarships, more than 40 students since 1993, also funds cultural, religious and youth activities in the countries around Hungary where indigenous ethnic Hungarians have become minorities in need. Currently the Foundation supports the renovation of a youth cultural center in Sárvásar in Transylvania (currently in Romania) as well as collects and transports clothing and other household items to poor regions of Subcarpathia (currently in Ukraine). The Foundation collects 85% of its funds from individual and corporate donations, and also is successful in gaining access to personal income tax donations through the tax system in Hungary. Full financial disclosure and other statements are available in Hungarian on this web site, as well as current summaries of activities, documented with photographs and video materials. For more information, please write to jokay ampersand ige dot hu.